Mountain biking in Cody offers a wide array of world-class trails and vistas thanks to our very compressed geology and vast expanses of public lands. There is something for everyone and enough to keep you busy for several days just to see the highlights. World-class is no exaggeration, and outside the Beck Lake trails, you are unlikely to encounter another rider. Maps of the Cody area trails are on MTBproject.com and TrailForks.com. You can download a map of the Beck Lake Trails here. 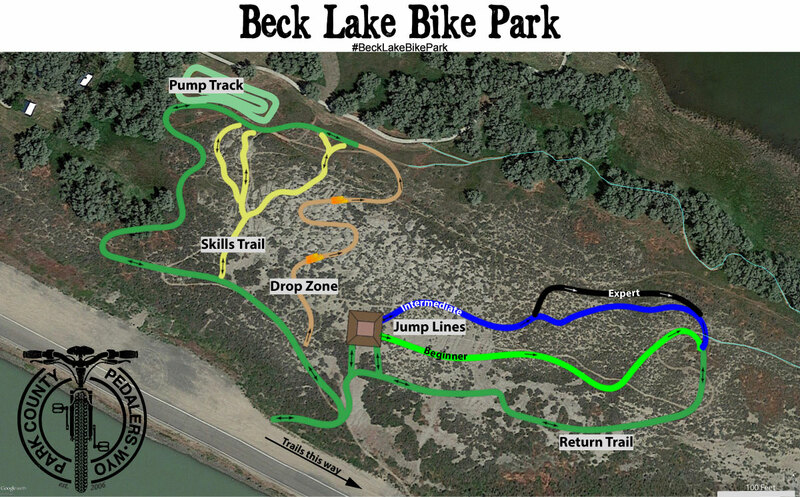 The Beck Lake Bike Park and Trail System has about ten miles of purpose built trails, jump lines from beginner to advanced (rollers up to 6 foot lips and drops), a pump track, a drop zone and skills trails. Flow Ride Concepts designed and built the park and it is spectacular. See images below, words cannot do it justice. We still need money and volunteers to maintain the bike park and trails. If you can donate time please use the contact page and if you can donate cash, please use the donate page. 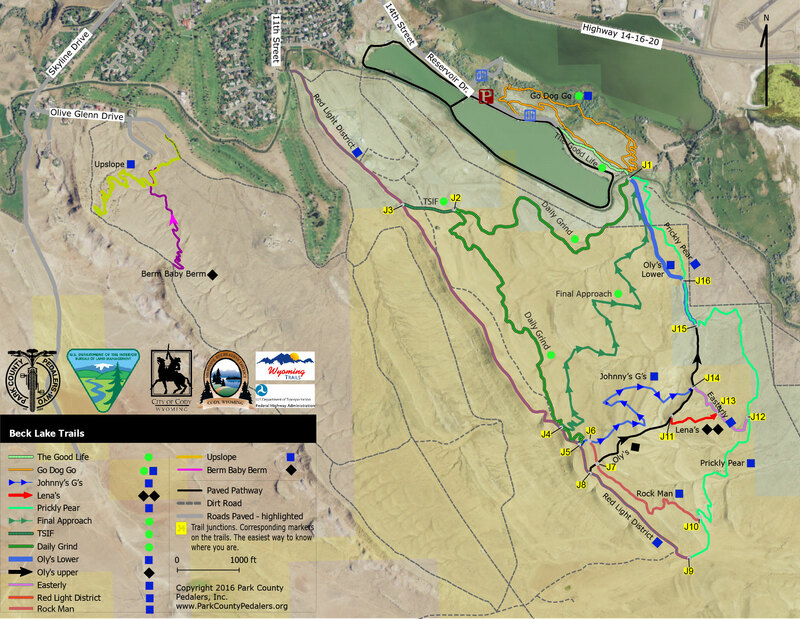 The park and trails are a joint effort between Park County Pedalers, City of Cody, Bureau of Land Management (BLM), Shoshone Recreation District and the State of Wyoming Recreational Trails Program. Machine built construction was done by Adam Buck and Trail Source. Preliminary design work was done by IMBA Trail Solutions and Scott Linnenburger of Kay-Linn Enterprises. There is a wide variety of difficulty at the Beck Lake trails, but we focused on wider, easy to ride wide trails, heavily sculpted flow trails and some natural rock lines. Beck Lake provides the ideal setting for progressing your riding skills before tackling the more remote and difficult trails in the area. trails in the area. Numerous individuals and donors and we thank you all! Getting there - This trail network has multiple touch points with the City. For those of you driving, the main trail head is found at Beck Lake Park. From highway 14, turn west on to Stampede Avenue. and then South on 14th street. 14th Street enters the park and becomes Reservoir Drive. ContactYou can't miss the bike park off to your left a quarter mile past the entry gate. Where Reservoir Drive ends at the paved pathway gate, the dirt trails start immediately to the left of the gated paved trail. Here is a Google map to help you find the trailhead. Maps of the area are available on MTBproject.com and TrailForks.com or if you want you can download a map. All major trail junctions have maps installed. This is what the trails at Beck Lake look like. There is something for everyone.